The Braun 3Series 380S-4 wet and dry electric shaver provides exceptional value for the money. It’s available cordless and can be used either wet or dry. Its casing comes in an attractive black and blue design. 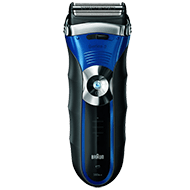 One highlight of the Braun 3Series 380S-4 is that it promises to get the skin smooth and clear even after a shave-free weekend. 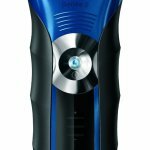 Like similar cordless electric shavers on the market, this Braun shaver can be used either dry or wet, with water, skin conditioners, and shaving lotions and creams, to provide a clear smooth shave. There are also built-in skin conditioners, in case you don’t plan on using any separate product. 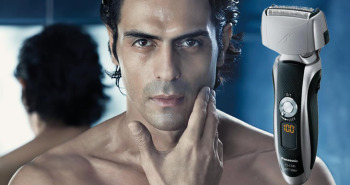 This shaver offers perfect shaving precision, even when you haven’t shaved for a few days. The “SensoFoil” technology allows the foil to glide across your skin, to reduce irritation and provide fast shaving in the morning. 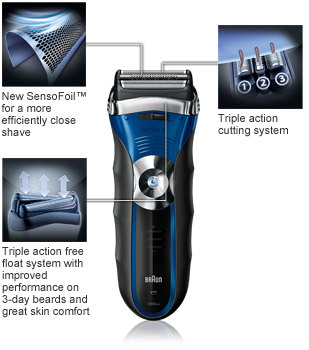 This is a more efficient shaving system than many other electric shavers on the market today. The Braun 3Series 380S-4 electric shaver has a linear-style foil cutter, rather than being a rotary style shaver. The three cutting blades will not only shave short hair, but long hair as well. A special precision built-in long hair trimmer will trim long beards, sideburns, mustache, and goatees, so you won’t need to buy a separate trimmer for that. The foil in the shaver protects the skin from irritation and keeps from getting the blades too close to your skin. It’s simple to wash and maintain the Braun 3Series 380S-4 electric shaver. Simply wash it directly under a running tap. It’s 100% waterproof as well, so if you like to save time by bringing your shaver into the shower, it works perfectly that way as well. The electric shaver has a completely sealed body, so that water will not seep in to wreck it. In order to ensure that you have the smoothest, cleanest shave possible, be sure to follow these instructions. For the best results, don’t wash your face first. Shave, before you shower, or if you’re in the shower itself, do your shaving first. During shaving, hold the shaver at right angles or ninety degrees to your facial skin. Stretch your skin with your fingers, and brush the shaver against the direction of hair growth. If you haven’t shaved for a few days, then you’ll need to shave the stubble off first, before having a final pass over your skin. The Braun 3Series 380S-4 electric shaver has a detachable power adaptor, so you can charge up your shaver when you need to. It comes with a built-in rechargeable battery with the latest technology, so it won’t suffer from the “memory effects” that batteries used to suffer from back in the 90s. Your shaver will continue powering up to regular levels even after years of repeated charging. The battery is a powerful Ni-MH battery. 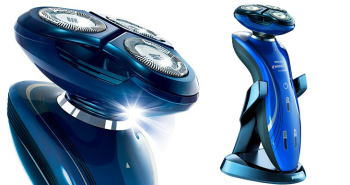 The Braun brand promises to deliver the latest electric shaver engineering in a solid, long-lasting mechanical body. This shaver should last you for several years at least, as long as you keep it cleaned, and replace the cutting blade and foil at least once every eighteen months. Refrain from dropping it on the floor either. The Braun 3Series 380S-4 electric shaver is really quiet, so that could be a bonus when you don’t want to wake up the rest of the family early in the morning. A small LED display screen will display your battery charge levels, indicating when you need to plug your shaver back into the wall to charge up again. There is also a handy charging status on the screen, so you can see how far along the charging level is. When you order your Braun 3Series 380S-4 you can expect to receive the following in your shipping box: The Braun 3Series 380S-4 electric shaver, a cleaning brush, a SmartPlug (100V-240V) power adaptor, and a convenient travel pouch. There’s also optional accessories to be purchased. It’s recommended that the cutting foil and blades be replaced at least once every eighteen months, in order to avoid any decrease in the functionality of the electric shaver. There is even a handy warning on the LED screen indicator to remind you when it’s time to replace your cutting parts. This shaver is a bit heavier than most at 1.2 pounds, but its solid state guarantees to shave quickly and smoothly, no matter what stage your beard is at. Besides the added weight, there is also no included plastic cover to protect the shaver. While there is a travel case, one sometimes wants to let the shaver dry out first, before stowing it away. But this is a minor hindrance to how well the Braun shaver actually performs. Braun ensures that all their products will arrive in excellent running order, with a two year warranty. 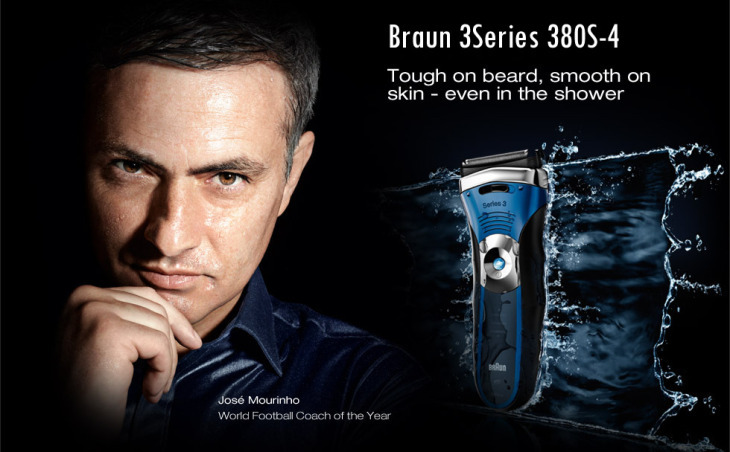 The Braun 3Series 380S-4 electric shaver is great for men who may forget to shave for a day or three. You won’t need to repeatedly go over your face, trying to get ready for Monday. It’s definitely recommended for men who have thick, tough to cut hair or beard. The electric shaver will make quick work of a three day old beard, and its comfort and ease of use will be sure to impress you for the reasonable price of the unit.